8/31 Cup of Coffee: It was a tough day on the farm, with the affiliates getting swept and the five teams combining for just 20 hits. 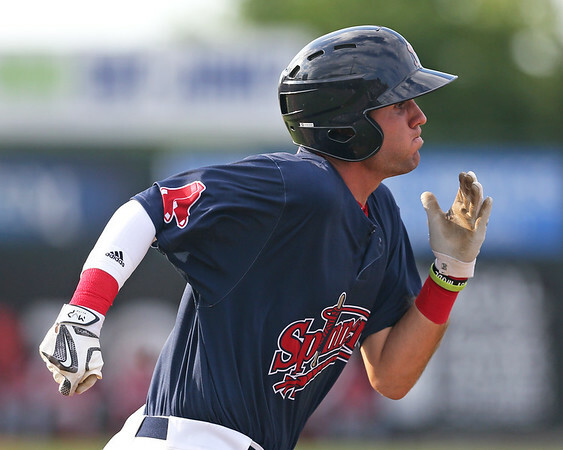 Pawtucket was officially eliminated from the playoff race despite a big game from Sam Travis (pictured), while a dominant Chase Shugart outing could not keep Lowell alive in the Stedler Division. Greenville's loss damaged its playoff chances headed into a critical final series. The PawSox were the unfortunate victims of Lehigh Valley clinching the International League's best overall record and top seed. Justin Haley turned in a solid start, allowing two runs (one earned) on five hits in five innings, striking out six and walking one. Travis Lakins turned in another scoreless outing, firing 1 1/3 hitless frames. Lakins has allowed a run in only two of the nine appearances he has made in Triple-A. Sam Travis broke out of an 0-for-18 slump with a perfect night at the plate, going 3 for 3 with a walk, double, and RBI. Rafael Devers was the designated hitter as he continues his rehab, going 0 for 3 with a walk, run scored, and a pair of strikeouts. Michael Chavis is prepared to continue dealing with the PED whispers and cat calls he gets at games from the crowds writes Kevin McNamara of the Providence Journal. "That's something I'll have to deal with," Chavis told McNamara, "but Lord knows when I'm playing at Yankee Stadium they're not going to be too kind anyway. It's just something to get used to." Denyi Reyes (pictured, left) has been named the South Atlantic League Most Outstanding Pitcher. The right-hander sported a 10-3 record with an 1.89 ERA and 122 strikeouts across 123 2/3 innings pitched for the Greenville Drive before his promotion to the Salem Red Sox on Aug. 4. Dakota Randall of NESN.com details five players to watch when rosters expand on Sept. 1 in the majors. Randall points out Brandon Phillips, Travis Lakins, Chandler Shepherd, Mike Shawaryn and Chavis as possible players to get a call up to the big club. 8/30 Cup of Coffee: Three teams were successful offensively, and two were not. Pawtucket saw six extra-base hits from six different guys, while Portland punched out 14 hits and Salem scored 10 runs. On the other side of the coin, Greenville lost in extras and Lowell was three-hit in a shutout. Kutter Crawford also earned himself a quality start for Salem, throwing seven innings of two-run ball. Meanwhile, in Pawtucket, Christian Vazquez and Rafael Devers each delivered a hit while on a rehab assignment. Chad De La Guerra (pictured) paced Salem with a 2-for-4 evening. 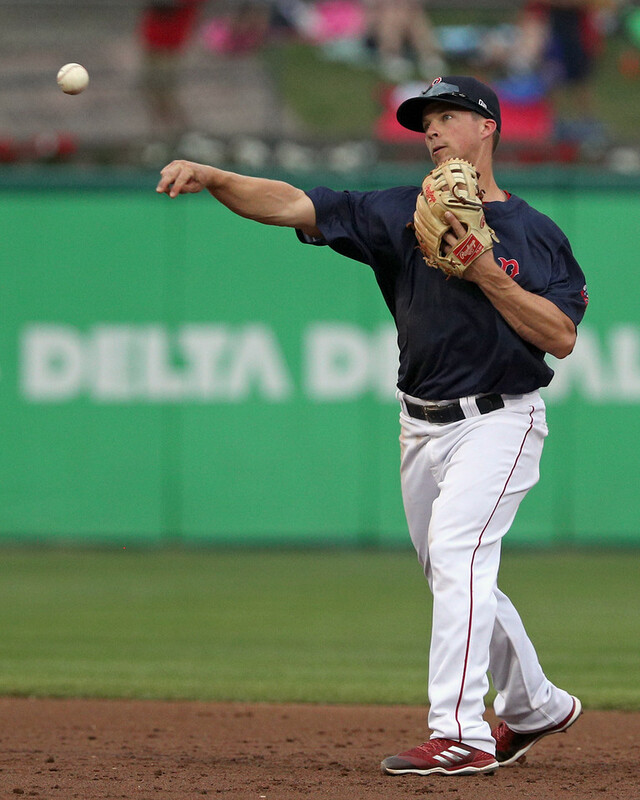 Christian Vazquez was 2 for 4 in a rehab stint and Dan Butler hit 3 for 4 from behind the plate with a home run as Pawtucket scored three in the first on the way to even the series with Lehigh Valley. The PawSox hit five doubles, one each from Tzu-Wei Lin, Rafael Devers, Brandon Phillips, Rusney Castillo and Tony Renda. Pawtucket also got six innings of one-hit ball from Mike Shawaryn, though he did allow two runs thanks to a walk followed by a two-run shot in the fifth. Josh D. Smith threw 1 1/3 innings of one-hit ball, and Robby Scott earned the save with a one-hit ninth. 8/29 Cup of Coffee: Of the five affiliates in action Tuesday, only Lowell came away victorious, with two teams suffering difficult walk-off losses. 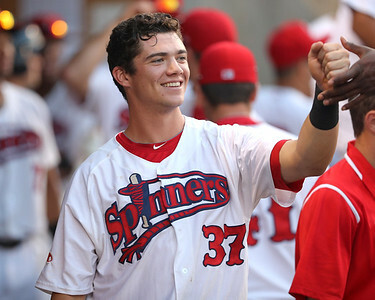 Nick Northcut and Brandon Howlett joined fellow 2018 draftee Devlin Granberg (pictured, left) in stopping the Spinners late-season slide. Greenville fell despite an outstanding Jhoanthan Diaz start, while Steven Wright threw two hitless innings for the PawSox. It was a tough evening for the PawSox despite some help from an MLB battery on rehab assignments. Knuckleballer Steven Wright, on the disabled list since late June after re-aggravating his left knee injury, got the start. He went two hitless innings with a walk and a strikeout. One day after catching Eduardo Rodriguez in Portland, Christian Vazquez was in Pawtucket, going 0 for 3. After a 9-for-17 performance that included eight runs scored in a four-game series in Buffalo, Michael Chavis could not keep up that staggering pace in his McCoy Stadium debut, going 0 for 4 with a strikeout. Chavis had entered riding a 16-game hitting streak across two levels. Mike Miller continues his excellent recent play, going 2 for 3 with two doubles and two RBI. He is 14 for 26 in his last eight games. 8/27 Cup of Coffee: It would've been a perfect day on the farm if not for a loss from Lowell. 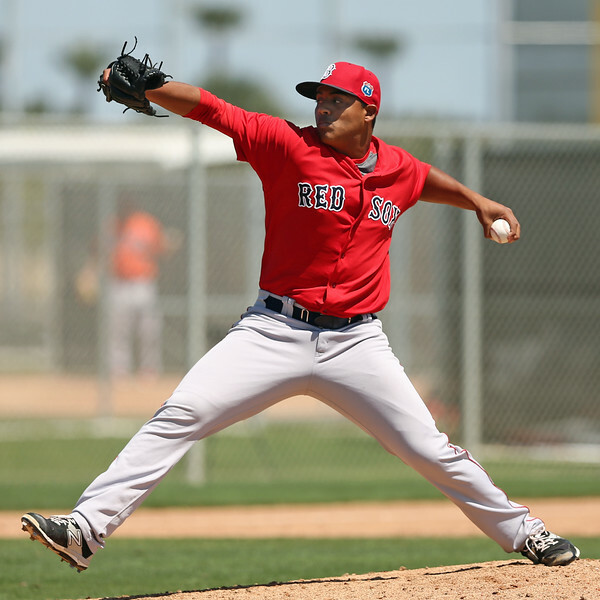 Fine pitching performances from William Cuevas (pictured), a rehabbing Eduardo Rodriguez, and Enmanuel De Jesus all resulted in wins. CJ Chatham could not be contained at the plate as the shortstop helped Salem steal an extra-inning victory. William Cuevas cruised through seven innings of work, matching a career-high with 10 strikeouts to push Pawtucket past Buffalo. The 27-year-old allowed five hits and two earned runs (a two-run blast from Vladimir Guerrero Jr. in the bottom of the first inning) while issuing just one walk to pick up his 10th win of the season. Travis Lakins picked up his second save with the PawSox with two innings of scoreless relief. International League batting average leader Rusney Castillo continued to pad his lead, going 2 for 5 with two singles and an RBI. Kyle Wren also added two hits. The win puts Pawtucket 5.5 games back of Indianapolis in the Wild Card race. Top-ranked prospect infielder Michael Chavis has continued to rake this season (see below for more detail) and was promoted to Triple-A as a result. Despite that, NESN's Dakota Randall argues that fans might have to wait a while before a big league call-up. Both Chavis and teammate Josh Ockimey earned a spot on MLB.com's Top Prospect Performers on Saturday and Chavis also made it on Friday and incredibly on Sunday as well. After Chavis' 80-game suspension to start the season, he knows the PED talk follows him and he's dealing with it as The Boston Globe's Alex Speier writes. 8/26 Cup of Coffee: On a weekend that featured the major league club taking its first three-game sweep of the season, the system's only playoff qualifier saw its season come to a close in wild, crushing fashion. The GCL Red Sox fell in the 11th inning in their single-elimination league semifinal. Greenville, with a dominant two-hit start from Angel Padron (pictured), continues to make its own playoff push. Meanwhile, the PawSox postseason chances might have been different if circumstances hadn't delayed the arrival of Michael Chavis until late August. For the first time in his Triple-A career, Michael Chavis failed to home run. In the third game since the 2014 first-round pick joined the PawSox he merely went 3 for 5 with two RBI and two runs scored. Chavis is 8 for 14 with 17 total bases since the promotion. Josh Ockimey homered in his second straight contest, adding a walk and a single. Tony Renda contributed three hits, picking up a pair of stolen bases. The PawSox offensive outburst was plenty to support Chandler Shepherd, who surrendered just two unearned runs on four hits in six innings. Josh D. Smith gave up a run in relief, but also struck out Vladimir Guerrero Jr., only the second time in his last nine games the Toronto über-prospect has gone down via strikeout. 8/26 Cup of Coffee: It was a stand-up second act from Michael Chavis in his second game since joining the PawSox, homering again (he hit a homer on Friday) and scoring three times while Josh Ockimey (pictured) also hit a round-tripper in the PawSox win. Esteban Quiroz also hammered a home run in his return to normalcy for Portland, and Durbin Feltman faced his first real set of adversity in a loss for Salem. 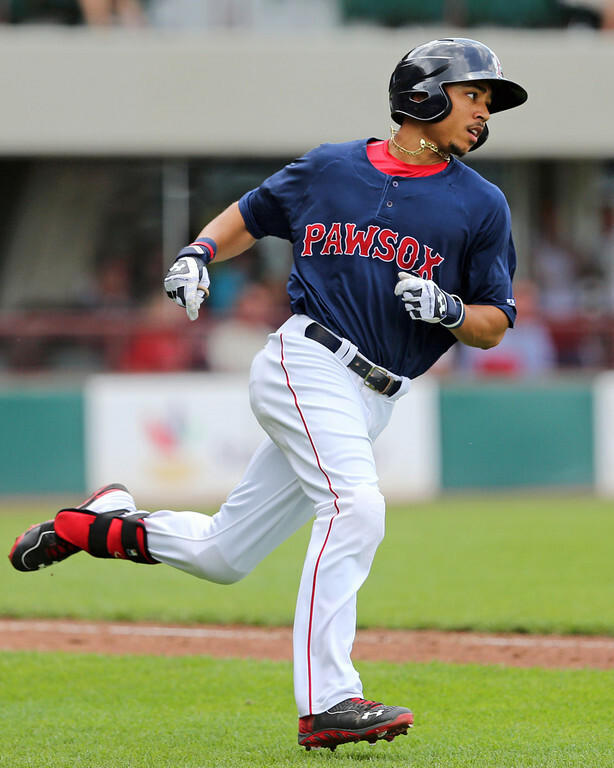 A night after making his smashing Pawtucket debut with a home run and two doubles, Michel Chavis once again mashed for the PawSox, going 2 for 5 with a home run, double and three runs scored in a 13-hit barrage from the Pawtucket offense. Josh Ockimey, in his 17th Triple-A game since his promotion from Double-A Portland, hit his fourth homer while adding two singles. 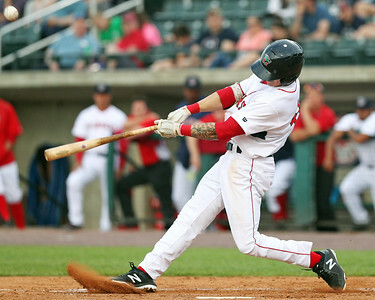 Dan Butler and Mike Miller compiled three hits apiece while Aneury Tavarez scored two runs. 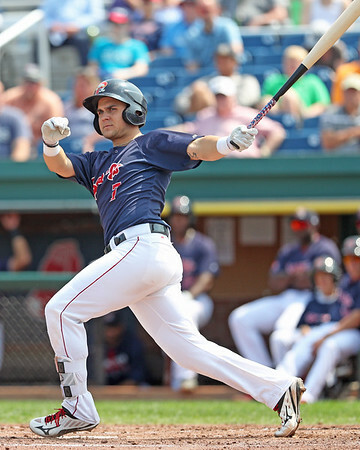 8/25 Cup of Coffee: Michael Chavis (pictured) stormed into Buffalo to join the PawSox, homering and doubling twice in his Triple-A debut to brighten what was otherwise a dreary day down on the far. The affiliates went 0-8, with five of the losses by a deficit of at least six runs. Other than Chavis, there were some individual highlights worth noting. Second-round pick Nick Decker made his long-awaited pro debut in the Gulf Coast League, veteran Brandon Phillips continues to rake for Pawtucket, and Alex Scherff turned in a solid outing in Greenville. Hours after his promotion from Double-A Portland was announced, Michel Chavis drew the start at third base and the sixth slot in the batting order. Things got off to an inauspicious start with a called strike three in his first plate appearance, but he followed that up with a two-run homer in the fourth and a pair of doubles. Brandon Phillips, 15 years Chavis's senior, ripped four more hits to continue his rampage through the International League. On August 2, Phillips was batting a meager .191 in his attempt to make it back to the majors. Since then, he is 30 for 72 (.417) with eight doubles. 8/24 Cup of Coffee: There were several outstanding individual performances down on the farm on Thursday. CJ Chatham (pictured, left) had four hits in Salem's loss, giving him seven over the last two days. Tanner Nishioka also had a four-hit night, including two doubles and a home run. No starting pitcher allowed more than three runs on the day, and four did not surrender a single run. Matt Kent went seven shutout frames in Portland's win, Jeison Pena and Jhonathan Diaz went six scoreless apiece for the DSL Red Sox1 and Greenville, and Lowell's Chris Machamer turned in five innings without allowing a run. The PawSox plated only one run, despite a 10-hit evening. Unsurprisingly, Rusney Castillo had two of those hits, as the outfielder continues to pace the International League in batting average (.329) and base hits (148). Brandon Phillips continues to be a consistent force, going 1 for 3 with a walk. Phillips has reached safely in 25 straight games. Josh A. Smith turned in a quality start, allowing three runs on five hits in six innings. The three runs allowed by Smith were the most given up by the starter in the system on Thursday. Portland earned a split of its four-game set in Manchester, largely due to the efforts of Matt Kent. The lefty scattered seven hits across seven scoreless innings, striking out eight without walking a batter. Kent threw 62 of his 94 pitches for strikes and lowered his ERA to 3.15. Trevor Kelley went two innings to complete the shutout. Jeremy Rivera had three hits and scored two runs out of the leadoff spot, while Luke Tendler hit a two-run homer as part of a 2-for-5 effort. Michael Chavis picked up another hit, extending his hitting streak to 12 games. Salem was on the receiving end of the shutout despite the best efforts of shortstop CJ Chatham. The 2016 second-round pick one-upped Wednesday's 3-for-3 performance by going 4 for 4 with a pair of doubles. He was 8 for 11 in the Frederick series. It was another solid outing for Denyi Reyes, who allowed two runs on five hits in six innings. Both runs came on a sixth-inning home run. Mark Montgomery made his Salem debut after a pair of rehab outings in the Gulf Coast League. The former Yankee farmhand was a top relief prospect whose career has gone off course due to injuries, most recently an elbow strain that had him on the shelf since May. He was signed in July as a minor league free agent. It was an all-around strong performance by the Drive, pairing strong pitching with an offense that ripped 11 hits, including six for extra bases. Tanner Nishioka (pictured, right) had a monster evening, going 4 for 4 with two doubles and a two-run homer. Jarren Duran chipped in with a double and a homer, his first round-tripper since he was promoted to Greenville at the beginning of the month. The seventh-round pick has 84 hits in 56 games as a professional. On the mound, Jhonathan Diaz earned his 10th win of the season, giving up only three hits in six shutout frames, striking out five and walking only one. Juan Florentino and Devon Fisher combined for three hitless innings to secure the shutout. The victory moves Greenville to within two games of Lexington in the South Atlantic League Southern Division second-half standings, with 11 games remaining. In the completion of a game started on August 7 the Spinners were unable to cut down on a 4-1 deficit. Jose Gonzalez had surrendered four runs in 3 2/3 before rain halted the contest three weeks ago. When play resumed, Logan Browning took the mound, cruising through three scoreless innings before surrendering a pair of runs in the eighth. Grant Williams reached base four times, going 2 for 3 with a double, two walks, and a run scored. The regularly-scheduled contest didn't go any better for Lowell, who managed only three hits in a shutout loss. The lack of offense wasted a strong outing by Chris Machamer, who gave up four hits in five scoreless innings of work. It was the first time as a pro that the former Kentucky Wildcat had completed five innings as a pro, as he lowered his ERA to 2.70 in eight appearances. 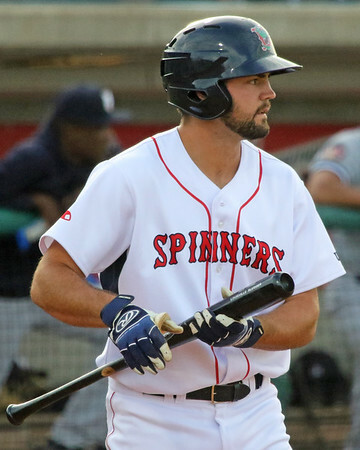 A Lane Milligan double was the only extra-base knock for the Spinners in the nightcap, while Devlin Granberg picked up another hit, his team-leading 59th. 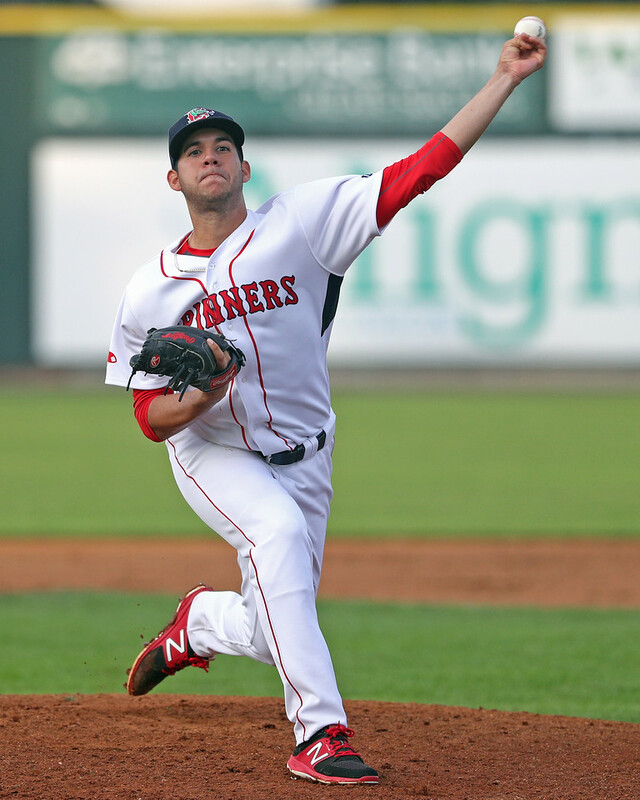 The sweep did no favors to the Spinners playoff hopes. They fell four games behind Tri-City in the Stedler Division, as the ValleyCats knocked off Brooklyn. While they sit only 1 1/2 games out of the wild-card spot, they face a significant hurdle there as well as three teams are ahead of them. While the GCL Red Sox were not in action on Thursday, their place in the playoff standings was firmly established. The win by the GCL Tigers West ensures that the Sox will finish with the third seed. The Tigers West trail the GCL Cardinals by 1 1/2 games for the top overall seed. Only one of the two DSL squads was in action on Thursday, as the Sox1 team knocked off the Marlins. Jeison Pena joined the parade of starters turning in excellent outings, giving up just three hits in six scoreless innings. He struck out two, walked one, and cut his ERA to 2.64 in what is almost certain to be his final outing of 2018. At the plate, Jose Navas picked up two hits, and Wilker Vargas added a double. Player of the Day: While another huge night by CJ Chatham and a bevy of scoreless outings on the mound all warrant mention, Tanner Nishioka earns today's recognition. The third baseman delivered four hits and 10 total bases to power Greenville. Nishioka has a .323/.401/.500 in 73 contests with the Drive, and he sits second on the club in both home runs and RBI despite having only the eighth-most plate appearances. It was the second four-hit game of the season for the 2017 ninth-round pick. 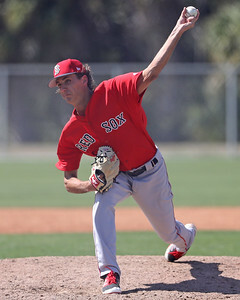 SoxProspects.com's own Ian Cundall released a Scouting Scratch on Mike Shawaryn on Monday. Cundall saw Shawaryn's debut at Triple-A Pawtucket on August 3 and provided a detailed scouting report on the 2016 fifth-rounder. 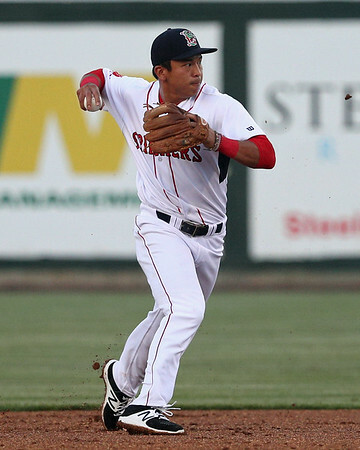 Darwinzon Hernandez (pictured) reached Portland for the first time on Wednesday as he and Jared Oliver swapped places on the Sea Dogs' and Salem's rosters. He made his first relief appearance since 2015 in the DSL, allowing an unearned run in one inning of work. He walked one batter and struck out one more but also drilled two New Hampshire Fisher Cats. You can read all about his exploits as well as what the rest of the farm was up to on Thursday's Cup of Coffee. 8/23 Cup of Coffee: Three different players on three different squads drilled four hits, but those teams were only 1-2 in a 2-6 overall day down on the farm that included two doubleheaders and two cancellations. 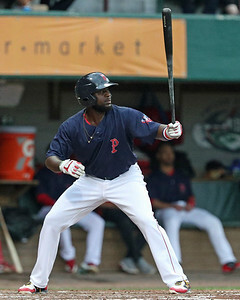 Brandon Phillips (pictured) helped lead Pawtucket to victory with his 4 for 5 effort, but identical lines from Grant Williams for Lowell and Gilberto Jimenez for the DSL Red Sox1 proved to be in defeat. Greenville was off and stayed three games out of the division, while Lowell is now two-and-a-half games behind Tri-City for the Stedler Division and one game away from claiming a wild card spot. Despite not playing, the GCL Red Sox clinched the South diviosn and will be headed to the playoffs. Brandon Phillips went 4 for 5, including a two-run home run in the fifth to lead the 11-hit charge, clinching Pawtucket's split with the Red Wings in a four-game set. Sam Travis and Ivan De Jesus Jr. each were 2 for 4, adding a pair of RBI. De Jesus drilled two doubles as well. William Cuevas was solid in six innings of work, allowing only an unearned run on five hits, walking only one against six strikeouts. Matthew Gorst also gave up an unearned tally in two one-hit frames, while Bobby Poyner finished it off. 8/22 Cup of Coffee: It was a busy night on the farm, with nine games on the slate, several with playoff implications. 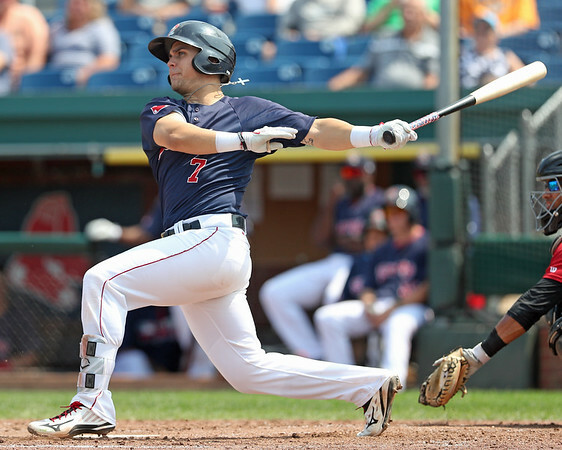 Michael Chavis (pictured, left) continued his hitting streak in style with a home run, while Josh Ockimey and Brandon Phillips went deep as the PawSox split a doubleheader. 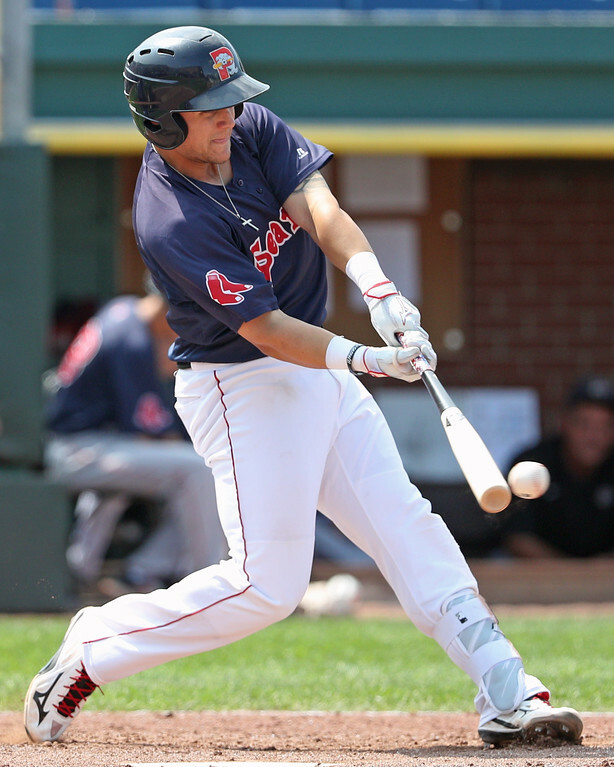 Lowell gained ground in its playoff push with a sterling effort by hurlers Thad Ward and Hunter Haworth, while Yasel Santana pushed the GCL Sox to the edge of a playoff berth with a strong outing in Florida. In the completion of a game suspended from July 5 that didn't have a whole lot go right for the PawSox, at least it created some fun for the record keepers. Josh Ockimey, still a member of Portland when the game began, was inserted to the lineup when the contest resumed in the place of the now-departed Adam Lind. Ockimey blasted a 445-foot home run as part of a three-hit effort, making him the offensive standout of the contest. While Ockimey already had two home runs since joining Pawtucket, the game logs now show his first home run coming 29 days before his promotion. The same applies to Travis Lakins, promoted three days prior to Ockimey. Lakins allowed two runs in 1 2/3 innings. 8/21 Cup of Coffee: A pair of current and former Boston Red Sox made rehab assignments on Monday night, with Eduardo Rodriguez impressing across four innings for Portland and Austin Maddox allowing one hit over one frame in the Gulf Coast League. Jeremy Rivera (pictured) raked out of the leadoff spot for the Sea Dogs, reaching base four times in five at-bats in the lone victory on the farm above Single-A. In a planned four-inning rehab start, Eduardo Rodriguez allowed one hit and two walks while striking out eight across four frames. The left-hander, making his first appearance with Portland since last year and possibly his only rehab assignment after suffering a severe ankle sprain on July 14, threw 39 of 63 pitches for strikes but left the game with a 4-0 lead. Jeremy Rivera reached base four times in a 2-for-3 effort, hitting a double and working two walks to go along with a run and two RBI. Dedgar Jimenez gave up all three runs across five innings, striking out four and earning the win for the Sea Dogs. 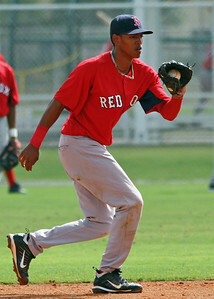 Former Sox prospect Santiago Espinal went 1 for 4 with a double and RBI. SoxProspects.com Executive Editor Chris Hatfield and Director of Scouting Ian Cundall got together for the 144th episode of the SoxProspects Podcast. The guys talked about the PawSox leaving Pawtucket, provided scouting notes on the current Pawtucket roster, and went in-depth on two of the hottest hitters in the system, Michael Chavis and Bobby Dalbec. After being in Pawtucket since 1973, the PawSox plan on moving to Worcester, Mass. The PawSox signed a letter of intent to build a stadium in Worcester that is scheduled to open in 2021. Per the PawSox, the move is still pending the approval of "the Worcester City Council, the International League, and the National Association of Professional Baseball Leagues ("Minor League Baseball")." PAWTUCKET, R.I. -- Right-handed pitcher Mike Shawaryn has been one of the most consistent pitchers in the Red Sox system this year. In Portland, Shawaryn made 19 starts, throwing 112 2/3 innings with 99 strikeouts and a 3.28 ERA and 1.13 WHIP. 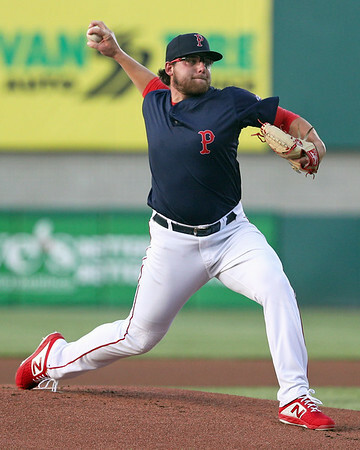 After the trade deadline, Shawaryn was promoted to Pawtucket where he has made three starts and one relief appearence, throwing 21 1/3 innings, allowing 13 hits, 6 runs, and 1 home run while walking 8 and striking out 24. I got the chance to see Shawaryn’s Triple-A debut on August 3, an outing in which he showed both the promise that makes him one of the top pitching prospects in the system and the weaknesses that lead to questions about his future role in the majors. Shawaryn started off very strong in the start, but as the game went on, he started to get into trouble. Shawaryn was selected in the fifth round of the 2016 draft out of Maryland. He excelled as a sophomore and was seen as a potential first-round draftee, but struggled his junior year, in part due to injuries, and fell in the draft. 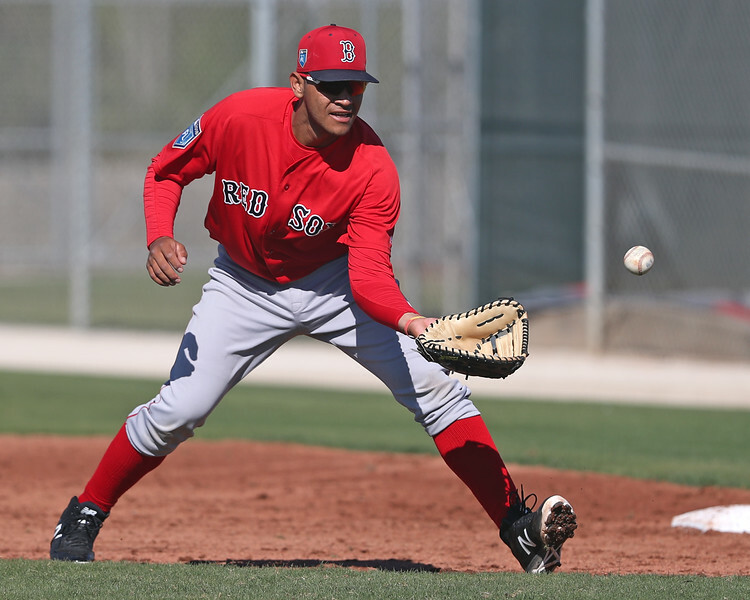 The Red Sox signed him for an over-slot bonus of $637.500 and he has steadily moved through the system, reaching the highest level of the minors in his second full season. 8/20 Cup of Coffee: It was a tough night on the farm for the bats, as four of the five affiliates in action notched exactly four hits. The highlights in the system came on the mound, particularly a surprising and dominant outing from Mike Shawaryn (pictured) in his first relief appearance as a professional. Yorvin Pantoja was also outstanding, lifting up a Lowell lineup and getting the Spinners to within half a game of first place. It was a pitchers duel at McCoy with the two teams notching just four hits apiece as they struck out a combined 24 times. Justin Haley surrendered a solo home run in the fifth that accounted for all of the game's scoring. Haley went 5 2/3 innings, giving up four hits, walking one, and striking out eight. Haley was followed by an unexpected face in Mike Shawaryn. The right-hander entered with two outs and the bases loaded in the sixth inning after all 54 of his previous professional appearances had come as a starter. Shawaryn did not have any problem taking to the role, striking out the first batter he faced to squash the Durham rally on his way to firing 3 1/3 hitless innings. Shawaryn finished with five strikeouts, and he walked a pair. 8/19 Cup of Coffee: A super performance from Matthew Kent (pictured, right) propelled Portland to a win while Jarren Duran extended his hit streak to seven games with Greenville. Pawtucket and Salem were both shut out while Lowell got a lift from Devlin Granberg at the plate. Former PawSox prospect Brandon Snyder delivered a two-run home run to break a scoreless tie in the bottom of the sixth after an hour and 20-minute rain delay. Starter Fernando Rodriguez Jr. got the no-decision with 3 2/3 innings of two-hit ball. The 34-year-old right-hander walked two and struck out three. Matthew Gorst took the loss after allowing the aforementioned Snyder homer. 8/18 Cup of Coffee: Jarren Duran (pictured) was a perfect 4 for 4, headlining the offensive performances in what was a strong day with the bats for the system. Chad De La Guerra had three hits in Portland and five different Spinners turned in multi-hit outings. Darinzon Hernandez struck out nine in six shutout innings for Salem and Jhonathan Diaz did not allow an earned run in his outing as part of a 4-2 day down on the farm. Sam Travis drilled a two-run home run and Cole Sturgeon lifted a solo shot to make a three-run third that helped to be the difference. Sturgeon added an RBI double in the sixth and Dan Butler contributed another with a productive out. Robby Scott walked one in 1 2/3 innings of no-hit work and Travis Lakins was perfect in 1 1/3 frames to close out the ballgame, grabbing his first save in Pawtucket. Josh A Smith allowed three runs on eight hits in six innings of work in the start, striking out seven against zero walks. 8/17 Cup of Coffee: There were several good pitching performances on the farm on Thursday, with Enmanuel De Jesus's (pictured) 10 strikeouts standing out above strong outings from Josh D. Smith, Daniel McGrath, and Denyi Reyes. Brandon Phillips and Pedro Castellanos stayed hot, and Ivan De Jesus Jr. drove in five runs for Pawtucket. Seven one-run innings from Josh D. Smith and a grand slam from Ivan De Jesus Jr. highlighted Pawtucket's victory. Smith only allowed two hits and walked two while striking out five. Brandon Workman followed with a scoreless eighth, striking out two. The PawSox put up six runs in the first led by the grand slam as well as RBI singles from Brandon Phillips and Sam Travis. 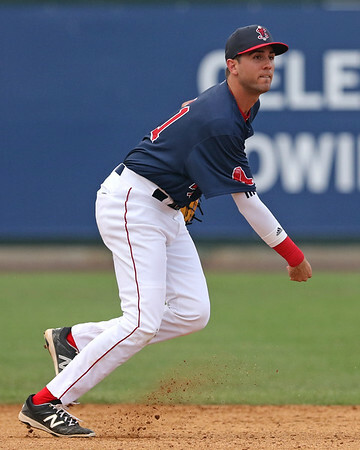 Phillips and Rusney Castillo each went 3 for 4, while Sam Travis went 2 for 4. Phillips is now hitting .359 over his last 15 games. In Tuesday's Daily Prospect Notes from Eric Longenhagen at FanGraphs, he takes a look at 2017 24th overall pick Tanner Houck (pictured, right). Longenhagen notes the Red Sox have been experimenting with different arm slots to try and maximize Houck's effectiveness. While initially they raised his arm slot, recently he has dropped back down to where it was in college, coinciding with a string of improved starts. 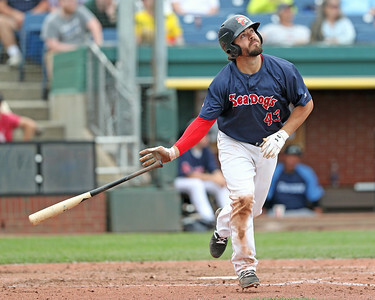 Sea Dogs infielder Michael Chavis missed the first 80 games of the season due to a suspension, but he is making up for lost time as noted in the Portland Press Herald. The top-ranked player on the current SoxProspects.com rankings has hit .303/.398/.539 with 5 home runs over 24 games and 89 at-bats since joining Portland. This is a considerable improvement from the .250/.310/.492 line he posted there in 67 games last season, and at 22 years old, he is still two years younger than the average position player in the Eastern League. Awards continued to roll in for Chavis for his recent performances. In Monday's minor notes, Chavis won the SoxProspects.com Hitter of the Week and he also won the Eastern League Player of the Week. He added to that by also being named to MLB.com's Prospect Pipeline Team of the Week. 8/16 Cup of Coffee: It was an even day on the farm, as the eight affiliates went 4-4 on Wednesday. Greenville had 14 hits in the best offensive performance, with three different players having three base knocks. Up in Portland, Deiner Lopez (pictured) was 2 for 4 with three RBI in the No. 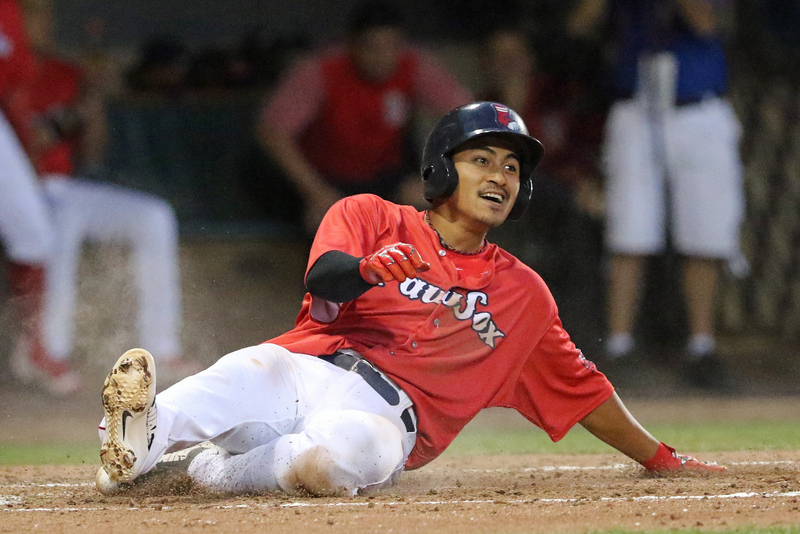 9 hole and Kleiber Rodriguez drove in three more for DSL Red Sox2, while Durbin Feltman surrendered his first run in Salem, and Lowell committed five errors in a loss. At the top of the lineup, Tzu-Wei Lin was 3 for 5 with a triple but it was not enough as Pawtucket fell on Wednesday. William Cuevas struggled with his control, walking four in five innings of work. That ended up netting the Tides four runs on nine hits. Matthew Gorst and Bobby Poyner did not do much better in relief, as each allowed a pair of runs in a pair of innings. Rusney Castillo added two hits. 8/15 Cup of Coffee: Dominant outings from Mike Shawaryn (pictured), Kyle Hart and Tanner Houck were the highlights of the night, while Sam Travis had five hits over two games. Brayan Bello racked up more strikeouts in the DSL, four players from Lowell played in the New York-Penn League All-Star game. Chandler Shepherd struck out seven over 5 1/3 innings but he also served up two home runs as he fell to 6-8 on the season with the loss. Marcus Walden fired 1 2/3 innings of scoreless ball to keep the PawSox close but they couldn't muster up enough offense to come back. 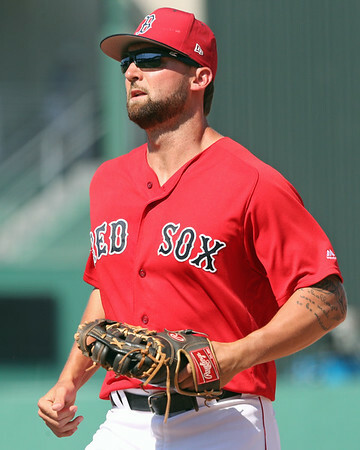 Sam Travis had the only offensive performance of note, going 3 for 3 with a double and an RBI. SoxProspects.com Director of Scouting Ian Cundall attended the game, and he noted that Travis is looking much more comfortable at the plate, and that carried forward to the second game of the doubleheader. 8/14 Cup of Coffee: With the PawSox getting rained out and Portland having the night off, Salem was the top affiliate in action on Monday and Kutter Crawford (pictured, left) and Jerry Downs combined to put on a show at Haley Toyota Field. The former picked up his first win in a Salem uniform while the latter blasted a three-run home run. Eduard Bazardo pitched well like Crawford, but the Greenville right-hander didn't get any support in a no-decision and Drive loss. 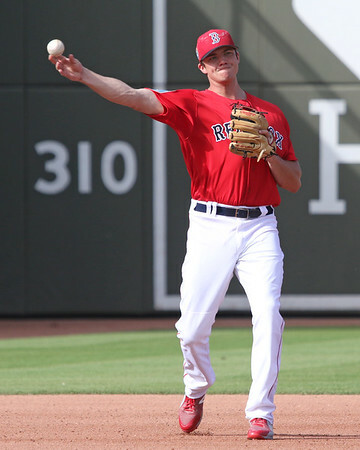 Alex Scherff made his second appearance on a rehab assignment with the GCL Red Sox. Monday night's game between the PawSox and Tides was postponed due to rain and inclement weather. The contest will be made up as part of a doubleheader on Tuesday, starting at 5:05 p.m. 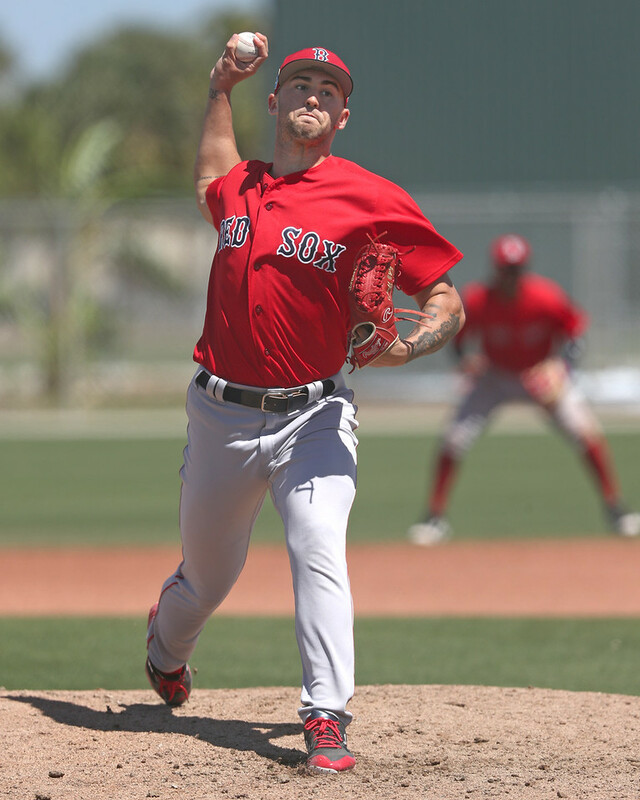 In his second start with Salem, 2017 16th round draft pick Kutter Crawford picked up his first win in a Salem Red Sox uniform, firing five strong innings of four-hit, one-run ball while striking out seven. After a tough-luck loss in his first Salem start on Aug. 8, when the right-hander tossed six innings of three-run ball with seven strikeouts, the 22-year-old Crawford got a little help from his teammates on Monday. Ian Cundall, Director of Scouting for SoxProspects.com, and Chris Hatfield, Executive Editor of SoxProspects.com, caught up on our latest podcast -- despite Cundall's silent protest -- on the Ian Kinsler trade, recent promotions, our August rankings and what exactly is a prospect? Be sure to give it a listen. Cundall also recently updated the scouting reports on Greenville right-hander Eduardo Bazardo, Lowell outfielders Tyler Dearden and Tyler Esplin, and Lowell infielder Andre Colon. Check them out by clicking here. 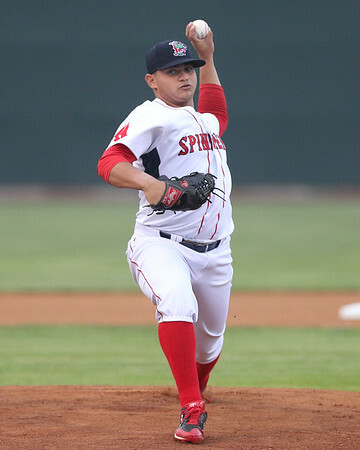 William Cuevas (pictured, top left) earned a quick promotion on Saturday, tossing an inning of relief in Boston's second game of a doubleheader with the Orioles. After pitching two innings of one-run ball earlier this season for the Red Sox, Cuevas walked two and struck out one in the scoreless inning of relief in the Red Sox' win on Saturday. The right-hander has a 3.45 ERA, 1.13 WHIP, and 102 strikeouts over 117 1/3 innings with Pawtucket this season and is currently the 56th ranked prospect. Since his promotion to Portland, third baseman and sixth-ranked prospect Bobby Dalbec hasn't skipped a beat. Dalbec is now tied for the most home runs in the minor leagues this year with his 31st homer coming in the Sea Dogs' win over the RubberDucks on Sunday. In 33 at-bats for Portland, Dalbec is hitting .364 with five home runs and 11 RBI. 8/13 Cup of Coffee: The dynamic duo of Michael Chavis and Bobby Dalbec showcased their prodigious power once more, stealing the headlines from a rehabbing Blake Swihart and several excellent long relief stints as Red Sox affiliates won 3-of-5 contests. Also shining were starters Jonathan Diaz and Matthew Kent, while Jantzen Witte continued his improved form. Lowell witnessed another washout in the second game of a doubleheader caused by Saturday's rain, while both rookie leagues were off. The PawSox overcame a 5-0 deficit through three innings by scoring nine unanswered runs, thanks in large part to a six-run explosion in the seventh. Jantzen Witte and Mike Miller each had run-scoring singles in the frame as part of three-hit days as part of a 15-hit performance from Pawtucket. Tzu-Wei Lin had a double and two walks as Sam Travis and Kyle Wren joined in on the two-bagger brigade. Since returning from an injury that prevented a big-league stint, Lin is 7 for 12 in three games, upping his OPS by almost 50 points. 2018 Donation Drive - We Need Your Help! We're asking for your help to raise $8,000 to keep SoxProspects.com up and running for another year. We have kept the site 100% free for almost 15 years now, and we hope to do so for the foreseeable future. As we scout dozens of games first-hand each year, travel costs pile up. Our other costs to run the site often go up on an annual basis as well, and our ad revenue only covers a portion of those costs. So we're reaching out to the community for donations to help us keep the site going. Donations help cover site costs in two primary areas: (1) first-hand coverage travel costs for scouting and player columns; and (2) general IT costs (hardware, software, internet costs, hosting fees, etc.). Your donations help us travel to Fort Myers in March to cover spring training and in the fall to cover the Instructional League each year, which are vital to get “one-stop shopping” for prospects across the system at levels we can’t see regularly. They also help cover the costs of travelling to affiliate games for regular first-hand coverage. We anticipate that our total costs will exceed $15,000 in 2018. While we may cover roughly half that from online advertising revenue, your donations help us ensure we can cover those costs in order to keep the site going. 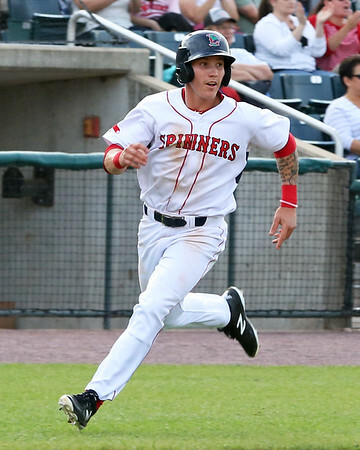 8/10 Cup of Coffee: While the system's former valedictorian was hitting for the cycle up in Toronto, its two biggest power bats were leading the Sea Dogs. 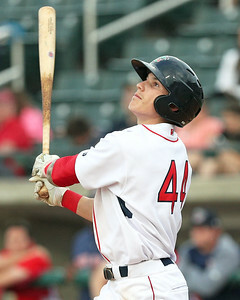 With two homers each, Bobby Dalbec (pictured) reached 30 homers on the season with nearly four weeks remaining and Michael Chavis continued his torrid stretch. Fellow hot hitters Pedro Castellanos and Jarren Duran led the way in Greenville's romp, and Mike Shawaryn paced Pawtucket's victory. Salem had the only loss among stateside affiliates, with Tanner Houck turning in an uneven but encouraging outing. Mike Shawaryn turned in a solid start to pick up his first Triple-A victory. The former Maryland Terrapin allowed two runs on four hits in five innings, striking out seven and walking four. Shawaryn was backed by a 13-hit attack by the offense, led by the three hits off the bat of Jantzen Witte. Josh Ockimey ripped his first double since last week's promotion, giving him hits in 10 straight games across two levels. Rusney Castillo picked up his 27th double of the year as part of another two-hit night. 8/7 Cup of Coffee: It was a near split on the farm on Tuesday, with three wins, four losses, and one suspended game. 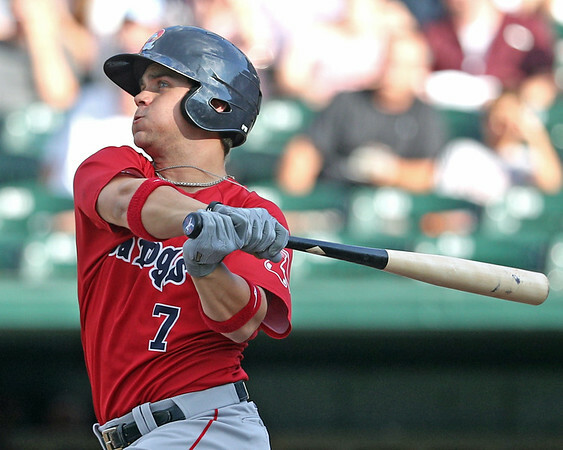 Despite Portland dropping its contest, Michael Chavis continues to ramp back up after his 80-game suspension, as the third baseman posted a four-hit night. CJ Chatham (pictured) had a monster game for Salem in support of a strong Jake Thompson start. The PawSox and GCL Sox also turned in victories. 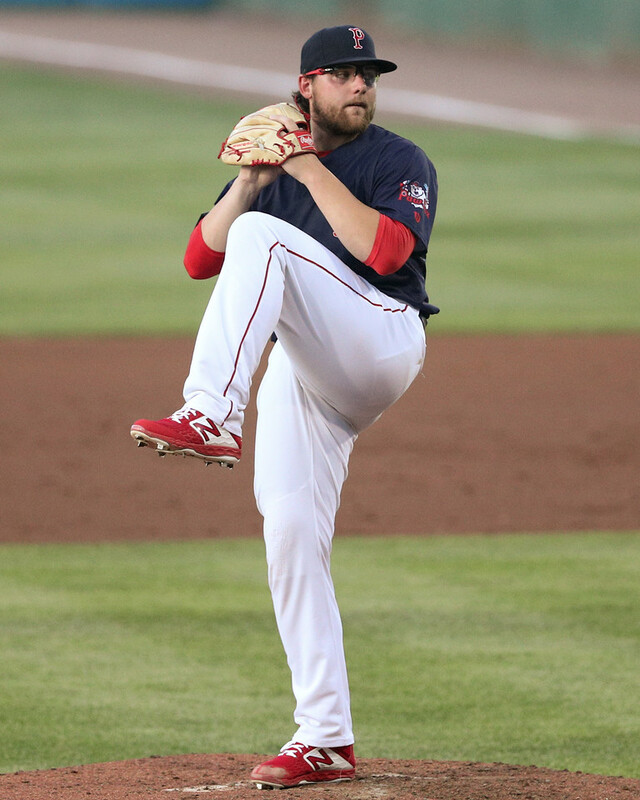 Josh A. Smith turned in a strong start to lead the PawSox. The right-handed Smith went seven full innings, allowing two hits and striking out five without walking a batter. Fernando Rodriguez and Bobby Poyner each turned in a scoreless inning of relief, with Poyner getting credit for the save. Sam Travis extended his hitting streak to nine games with an RBI single in the third inning. Josh Ockimey also added a single and an RBI, while Rusney Castillo added two more hits to his International League leading total. 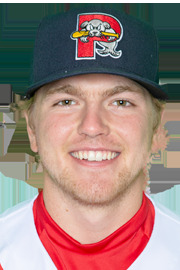 8/4 Cup of Coffee: Tony Renda (pictured) doubled and homered for the PawSox, and he was rewarded with a call-up to Boston after Ian Kinsler injured his hamstring on Friday night. Josh Ockimey and Mike Shawaryn each had solid outings in their Triple-A debuts, while Portland, Salem, and Lowell were all rained out. Jarren Duran picked up right where he left off in his first game in Greenville, and Oscar Rangel hit a clutch grand slam in the DSL. Tony Renda probably did not think he would end his day with a promotion to Boston, but with Ian Kinsler and Rafael Devers on the disabled list for Boston and Tzu-Wei Lin banged up in Pawtucket, Renda saw his name called. He made a statement with his performance on Friday, going 3 for 5 with a home run, double, and three runs scored. Rusney Castillo also had three hits, and Brandon Phillips launched a three-run walk-off home run. With the trade MLB non-waiver trade deadline now come and gone, the Red Sox totaled 13 transactions in the past two days. Between releases, promotions, and placements on the disabled list, the Red Sox have been plenty busy in the wake of one of the more exciting weeks of the baseball season, even though Boston didn't make a deal on deadline day. 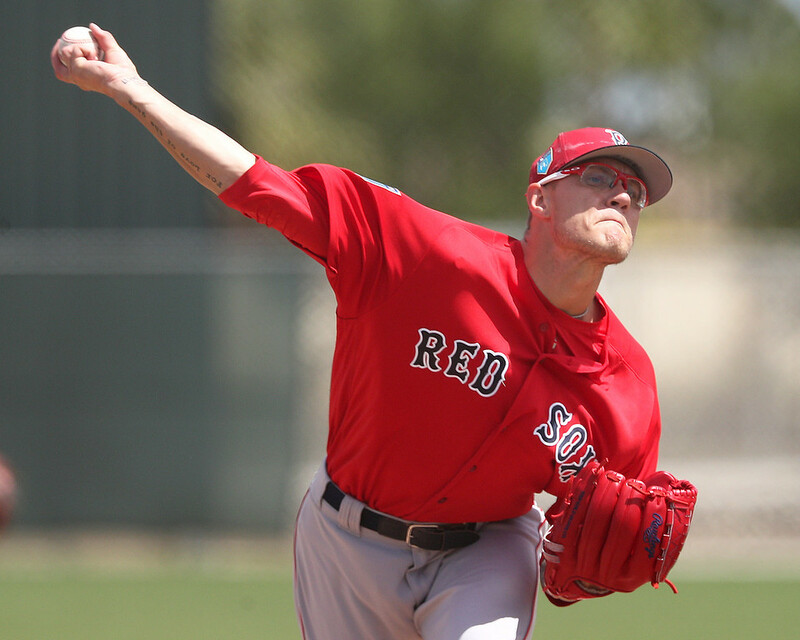 Late on Monday, however, the Red Sox acquired veteran second baseman Ian Kinsler in exchange for right-hander Ty Buttrey (pictured, right) and left-hander Williams Jerez. In June, SoxProspects.com Director of Scouting Ian Cundall coincidentally wrote up a piece on both relievers. Cundall updated that story with stats and the status of Buttrey's injury. Executive Editor of SoxProspects.com Chris Hatfield tweeted he has no problem with the trade. Buttrey was ranked 19th, and Jerez was 26th in our current rankings of the Sox system. Getting back to Tuesday and Wednesday's activities, on Tuesday the Red Sox placed Salem's Roldani Baldwin and Bryan Mata on the disabled list, before adding Jake Romanski to Salem's roster. 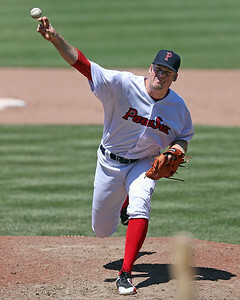 Travis Lakins and Matthew Gorst were promoted from Portland to Pawtucket. Kinsler was activated to the Red Sox roster, and Tzu-Wei Lin was optioned back to Pawtucket, while Brandon Workman was recalled back up to Boston in a corresponding move to Chris Sale being placed on the DL.